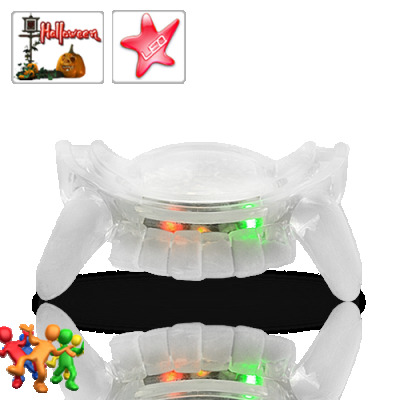 Successfully Added Vampire Fangs Multicolor Flashing LED Mouthpiece to your Shopping Cart. Add a colorful bite to your Christmas and New Year festivities with this Vampire Teeth Flashing Multicolor LED Mouthpiece. Perfect for a few laughs and to show off your Christmas spirit, these comfortable-to-wear mouthpieces flash 4 different colored lights that are sure to grab some attention. 100% safe and comfortable, leave these in your mouth all day and when the sun goes down, turn it on and let your true colors show! Enjoyed by kids and adults alike, these fun Vampire Teeth Flashing LED Mouthpieces are sure to make everyone smile and literally lighten up the mood! Don't miss your chance to be the star of your next party or event! This Vampire Teeth Flashing LED Mouthpiece is available in our warehouse now for single or bulk orders. But be warned: Due to limited stock, once this item sells out, we will not be restocking. So get your orders in now! PLEASE NOTE: Once this item sells out, we will not be restocking. The Vampire Teeth Multicolor Flashing LED Mouthpiece batteries are not replaceable once they run out. We also do not offer any returns. on 2011-11-01 05:56:35 Phenomenal find! I just received my "fangs" and took them out of their box. I clicked the switch on the center of the mouthpiece and the LED's light up like Christmas!